The President of the Senate, Pietro Grasso, called it ‘an act of compassion’, although it’s not very clear that it in fact was within his powers to prevent it. What seems clearer is that the dead king didn’t need to return on a special army transport: we could have been spared both the official act and the final expense, along with the deference that they implied. 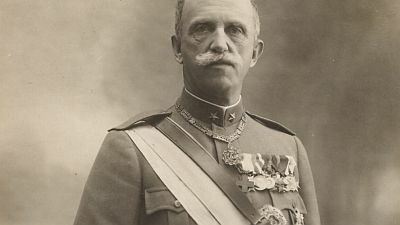 The remains of Victor Emmanuel III, Italy’s de-facto last monarch (he reigned for a full 46 years, while his successor lasted less than one month), were flown last month from Alexandria, Egypt, to a military airstrip in Cuneo. They were then transported to the small sanctuary of Vicoforte, there to be reunited with those of his late wife, Queen Helen, which had arrived the day before from France. 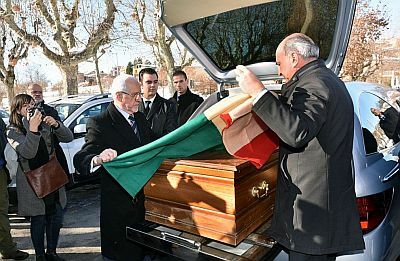 Their exile was self-imposed: they left in haste in May of 1946, leaving their less tarnished son Umberto in charge, in the hope that it might persuade Italians to vote for preserving the monarchy in the June referendum. It did not. Following the referendum, a ‘temporary rule’ of the newly drafted Republican constitution banished the male heirs of the family from the Italian soil, lest they tried to seize power again. The rule was finally abrogated in 2002, opening the door to the return not only of the living members Savoies, but also of the dead ones. The ‘act of compassion’ might have been just that, were it not for the guard of honour provided by our armed forces and – more importantly – for the fact it opened the door to new claims from the descendants of the last king. Namely, that Victor Emmanuel and Helen be buried not in the modest chapel that houses their famous forebear Charles (d. 1630), but at the Pantheon in Rome, the burial place of the few other kings and queens of our short-lived monarchy. Such a move would have a much greater symbolic significance, going a long way towards rehabilitating the Royal Family and amending the historical judgment on the role it played in a great many crimes. Albeit initially more moderate than his parents, Umberto and Margherita, Victor Emmanuel has a lot to atone for. He is principally responsible for the country’s disastrous participation in the First World War, having invoked the extraordinary powers granted to him by the Albertine Statute to override the will of parliament. After the war, he presided over the government’s turning a blind eye to the campaign of violence of the nascent fascist movement. Most extraordinarily, he turned the farce of the ‘March on Rome’ into a successful coup d’état, elevating Mussolini to the prime ministership just as the army was poised to regain control of the capital. From that moment, he rubber-stamped every measure introduced by Mussolini not just to legalise Black Shirt violence (beginning with the abduction and murder of socialist MP Giacomo Matteotti) but gradually abolish all democratic freedoms, and ultimately hollow out the powers of the monarchy itself. In the 1930s, he was the figure-head who accepted the titles of Emperor of Ethiopia and King of Albania, and who signed off on the racial laws that targeted the Indigenous population in the African colonies (1936) and the Jewish population in Italy (1938). That’s not all. Having given his enthusiastic assent to Italy’s late entry into the Second World War in the June of 1940 – when it looked to like the tiniest of helps to Hitler’s seemingly inexorable advance would translate into big gains at the peace-making table – the king behaved just as disastrously three years later, when he was left with no choice but to oust the Fascist leader. It was then that, after putting Marshall Badoglio in charge of the government (and it was no progressive choice: the man was a butcher), he fled to Brindisi, to spend the rest of the war under the protection of the Allied command. 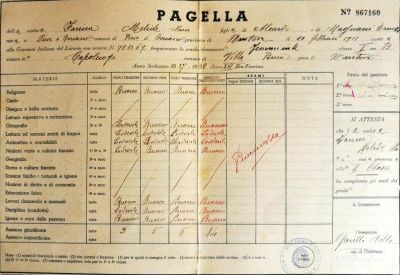 Left without orders, the Italian army units stationed both overseas and in the Italian regions not yet under Allied control were swiftly captured by the German army. Those who didn’t surrender, ended up fighting on the side of Mussolini’s soon to be formed puppet regime. The rest – some 600,000 men – were deported to German labour camps. It is at this time that the deportation of the defenceless Jewish population began. And it is the Jewish community that has been most vocal in opposing any move to transfer Victor Emmanuel and Helen to the Pantheon, a short distance from the historical sites of those mass abductions. Their response has included a full-blown mock trial of the late king. 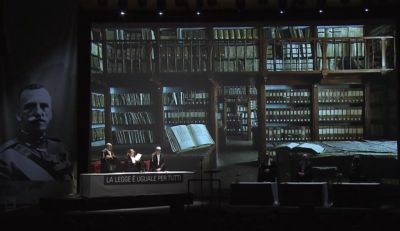 The trial, ‘written’ by Viviana Kasam and Marilena Francese, featured the testimonies of survivors of the Shoah and descendants of deportees and forced exiles, in front of a judging panel that included a former minister of justice and a prominent anti-mafia prosecutor. Focussing on the passing of the ‘racial purity’ laws of 1938 – which Victor Emmanuel had the power to veto – it found the late king, of course, guilty. But its value was primarily as a creative intervention, within a media environment structurally disposed to present historical events as a contest between opposite and equal sides. Recorded at a theatre in Rome ahead of Holocaust Rememberance Day, the trial of Victor Emmanuel III was televised in prime time on that, which in Italy goes by the name of ‘the day of memory’. But memory, again, implies a contest: the averaging out or mediation of sometimes opposite recollections. The forensic setting of a trial – while founded in part on the institution of the testimony – constitutes instead an attempt to (re)establish a knowledge of history, as a truth determined by civil institutions that cannot be called into question barring new evidence, and a further trial. Italian Fascism never had its own Nuremberg, and the new Republic – which was formally founded on the repudiation of the old regime – chose to proceed, both culturally and politically, by means of amnesties rather than trials. And so here we are, having to metaphorically exhume the dead not so we can defeat again Fascism back then, but prevent its deep roots from sprouting again. This one is straightforward: it’s a collection of my mother’s primary school reports, or rather of the four out of five that survived. But it still comes with questions. Above all, this: when is a school not a school? What are the criteria to assess the value of state education, and what distinguishes it from its opposite – indoctrination? My mother turned six in February of 1937. Her formal education began therefore when Mussolini’s reform of the school system was well and truly complete. 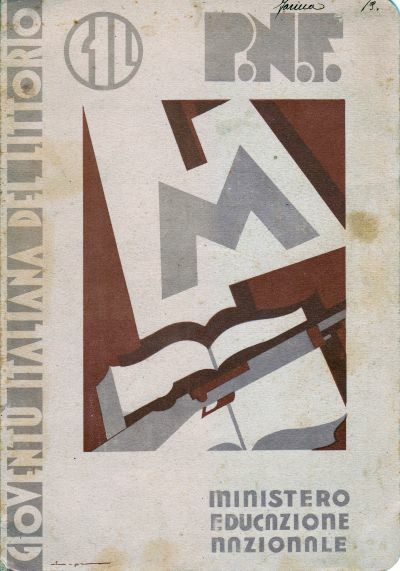 Two disciplines in particular – “General knowledge and fascist culture” (grades 1 to 3) and “History and fascist culture” (grade 4 and above) – had been introduced in the 1932-33 school year. Alongside existing ones such as “Hygiene and personal care” and “Manual and female work”, they give us more than a mere glimpse of the model student that the Fascist school sought to produce. To make this totalitarian project even more overt, the school reports from this period are elaborate affairs with very high production value and obvious propaganda intent. This is the cover of the first report that Mum took home, in June of 1938. 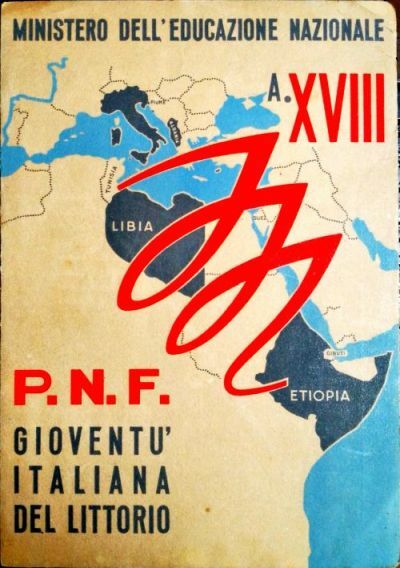 Note that the name of the Ministry of National Education is smaller than Gioventù Italiana del Littorio – the Fascist youth organisation in which all pupils were signed up upon enrolment – and the acronym of the National Fascist Party (PNF). 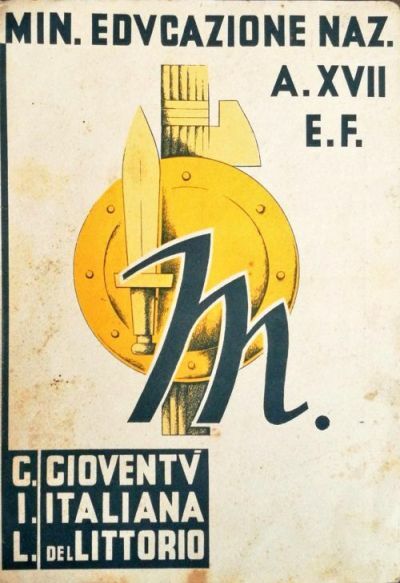 As for the picture, it features the M of Mussolini over a stylised axe, above a rifle resting over a book – the latter symbolising the motto “book and musket make the perfect Fascist”. 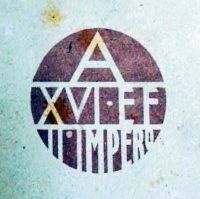 At the back, the year is given according to the fascist notation (year XVI of the Fascist Era, ie 1937), above a reminder that of the advent of the “Second Empire”. This is the far-less-remarkable inside, resembling pre-Fascist reports in most respects. At the end of her second year of primary school, in June of 1939, my mother took home this report. We’re at the eve of the Second World War, and the book is gone, to be replaced by a wholly martial imagery. The Fascist year notation is now to be found on the front cover, and there is no back cover. The report from June of 1940 is the most remarkable of our small family collection, and a lesson in military history and geography. 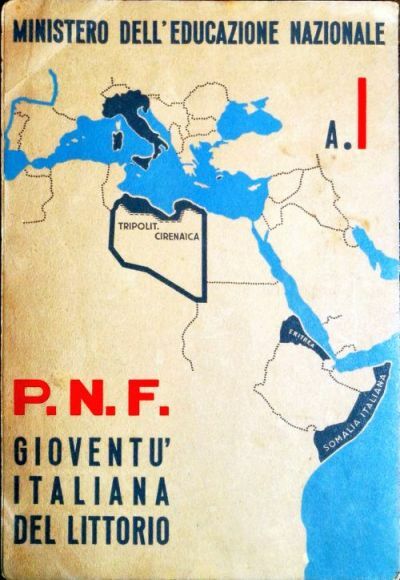 The scarlet M of Mussolini links Libya with Ethiopia, which the regime had brutally invaded in 1935. At the back, the Italian colonies are shown in greater detail, within the silhouette of those still-resisting countries. For them, it’s apparently Year One of life under Italian rule. The report from Mum’s fourth year at school has gone missing. Her final one dates June 1942, one year and one month before Mussolini was to be deposed. Italy has joined the war by now. 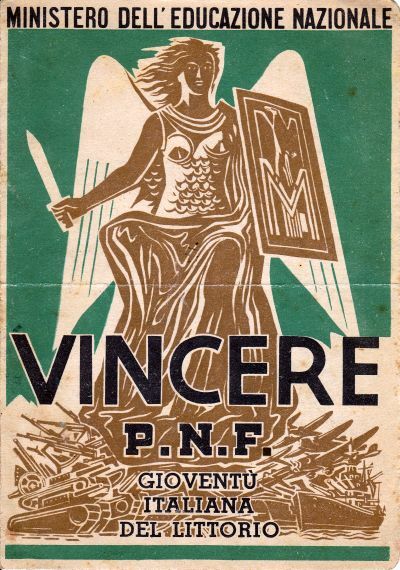 An unusually winged and armoured allegory of Italy, her shield decorated with an imperial eagle and the M of the still-boastful Duce, is seated above the word VINCERE (“To victory”). Reader: we were about to lose. 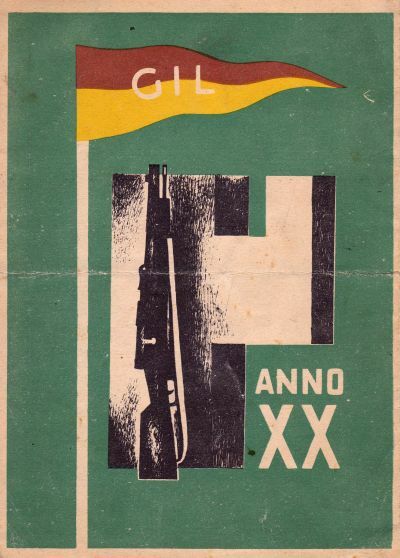 At the back, a gun rests on a stylised Axe, below the standard of the Fascist Youth. I cannot really imagine what Mum’s school was like, nor what it was like to grow up in a small village in a totalitarian country. I know that she was a good student, which is why the reports were kept in the first place. And I know that one of the books she loved (and that was not part of the syllabus) was a collection of the Greek myths that form the prologue to the Iliad, adapted for a young audience by Laura Orvieto: a Jewish writer that in those years was hiding first from persecution, then from deportation. Those stories, I think, were the spark that ignited her love for a culture that had other things to offer than a virile ideal of colonial conquest, and helped her forge a path towards secondary education and eventually a life outside the small village, in a country that strived in complicated and sometimes ambiguous fashion to leave Fascism behind. But that’s another story. These are just documents, relics of a time when children were taught not what they should love, but whom they should hate.